I'm forging ahead with my Jil Sander Perfumes That Nobody's Ever Heard About* series of reviews, and the whole enterprise is seeming a little strange. Why write about perfume no one's ever heard about, or, to be more accurate, perfumes most people will probably never smell? Maybe after reading this, you'll give Jil Sander Woman 2 or 3 a shot. Where 2 was all bitter green, butch leathery, and extra-arid dry, 3 starts off with a juicy galbanum-laced start, the pronounced masculine feel (perhaps) from the coriander, rosewood and bay leaf combo. In the several times I've tried this, I've caught a whiff of a narcotic white flower I thought was gardenia but must be some combination of jasmine, ylang-ylang and tuberose. JS3's heart is gorgeous: it retains traces of the green, fresh top notes, and then moves to a powdery orris that transitions to spring-fresh florals such as rose and lily of the valley. By the time it begins to dry down, you feel you've been on a roller-coaster ride of personalities. As the fresh green opening hovers over florals and powder, its animalic base rounds it all off with with a mossy, incensey, leathery, creamy sandalwood finish. As much as I like Jil Sander Woman 3, it confuses me a little. Its pieces don't fit together somehow, or even clash in a way that makes sense (Must, Miss Balmain, etc.). There's something a little unfinished about Jil Sander Woman 3 that leaves me wanting, although each time I sniff my wrists I get something gorgeous. (Maybe it's unfinished/showing-its-seams in a deliberate, postmodern way?) If I remember that it was released in 1986, though, its androgyny seems ahead of its time. It resembles a scent you could find at Barneys now— niche and a little experimental. "I cannot think of another full-on leather scent that can I never, ever tire of. Even some of my other, wonderful, favorite leathers can be a little hard on my stomach... if over-applied. But this one... just gets *better*. It's a creamy, sort-of leather that isn't quite like suede. It's mild and medicinal at the same time -- medicinal, meaning it has a salubrious and restorative kind of *freshness*, which calms and focuses the mind. If it were a *place*, it would be an elegant, light-flooded, modern flat with modern classic furnishings by Le Corbusier, or Gropius... And copious bookshelves full of psychoanalytic and postmodern theory. If it were a *car*, it would be an eighties-vintage, "M" series BMW. White with cranberry interior. If you EVER get a chance to smell this sensual, smart, unisex masterpiece, don't pass it up!" * No one besides Gaia from The Non-Blonde, anyway, and from Hillaire, the VERY enthusiastic Basenoter above who's into Jil Sander Woman 3. Maybe these Jil Sanders were discontinued because they came out during the Boucheron, Poison, and Rumba era, when perfumes started to get fruity and bombastic. They retain a 70s affection for green notes and a 40s affection for leather-chypre-animalic qualities, both of which are pretty masculine in character. Feminine perfumes were in drag in the 80s, so I could see how these might not fit in. They're a little too dry, androgynous, and low key. I bet they'd succeed now if they were re-released. Great reviews - these both sound wonderful. My experience of harsh leathers is limited to Azuree, which is just a bit harsh for me. If Jil Sander 3 is gentler, it would be more attractive to me. I love the androgyny - and your postmodern comment about having the seams showing! Those ad photos are interesting, especially the one for JS2. 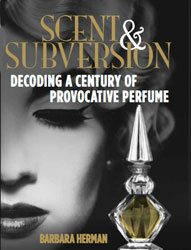 An oddly off-centre image of a woman who looks quite indifferent to the idea that she is selling perfume. She looks like she was waiting for a bus. That is so appealing, when you compare it to the aesthetic used to advertise those big 80s power scents you mention. Also, in a quick online search I noticed that JS3 seems much easier to come by than JS2. Was JS2 a commercial flop? Am I wrong-- is Jill Sander 4 an 80's perfume? If there's ever been a perfume that conveyed pastels, power pearls, and shoulder pads, JS4 is it to me-- and, somehow, I love it!! It may well be the fruitiest scent I can honestly say I love. How are you?! I will have to send you a private message so we can truly chat. Yes, JS4 is 80s — all of em I think. I'm wary of fruity scents, but I'm going to give it a try! Funny how 2, 3, and 4 get progressively sweeter. I know you liked Bandit, and 2 was really Bandit-esque. You'll hear from me shortly! Thanks for stopping by. I wore JSW3 and adored it. I still have my empty bottle and love to sniff and take in the memory. I have never found another scent quite like it. The image of someone sniffing an empty bottle is so sad, Nicolibba! But I understand. It's beautiful! Thanks! this artical was an intelectual ( & a bit painfull...) pleasure.